Even though his lead actors are currently busy with their respective projects, filmmaker Ashutosh Gowariker has decided to take his magnum opus Panipat a step ahead. The director-producer has already started work on this historical drama featuring Arjun Kapoor, Kriti Sanon and Sanjay Dutt in lead roles. He also gave us a sneak-peek into the sets of the film that is currently under construction. Ashutosh Gowariker will be recreating the epic war of Panipat with three major actors who are coming together for the first time. The film will feature Arjun Kapoor and Kriti Sanon in the role of fierce warriors and both of them were recently snapped whilst prepping for the film. Amidst their other schedules, Arjun and Kriti took some time out to learn horse riding. While the actors are seen doing their bit, the filmmakers of Panipat too came together to erect the massive sets that the epic drama would require. Recently, Ashutosh was seen accompanied by his wife Sunita Gowariker, who is also the producer of the film and art director Nitin Desai. 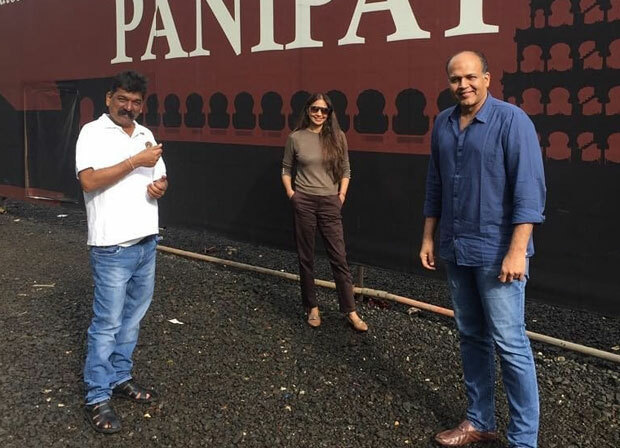 It seems that the trio came in to supervise the sets that are being constructed in ND Studios in Mumbai. They are attempting to recreate the iconic location of Shaniwarvada. Although we have these details, we are yet to get a glimpse of the set that is currently being made. Directed by Ashutosh Gowariker, Panipat is his fifth period drama after Lagaan, Jodhaa Akbar, Khelein Hum Jee Jaan Sey and Mohenjo Daro. On the other hand, the Arjun Kapoor, Kriti Sanon, Sanjay Dutt starrer, based on the real life battle of Panipat that happened in the 18th Century, is expected to hit the theatres on December 6, 2019.